Studio Wildcard continue their near limitless potential to dish out massive updates on a regular basis today with yet more content for ARK: Survival Evolved as survivors welcome an update of a more seasonal variety with the release of the Winter Wonderland update. Just in time for the Christmas holidays the Winter Wonderland update changes the usually harsh environments of ARK: Survival Evolved in favor of a more seasonal variety. 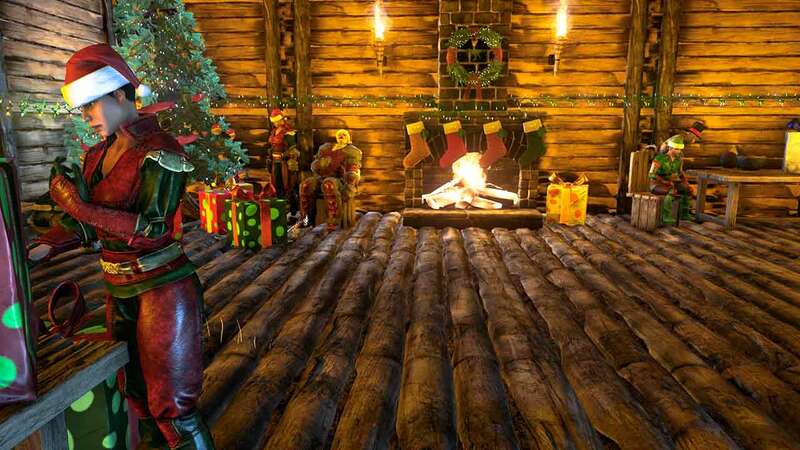 Survivors can now collect brand new holiday items, complete new festive challenges and even explore the lands of ARK: Survival Evolved in a wonderful Reindeer Costume. A variety of new decorations will also be available, afterall what’s Christmas without that colorful touch to come home to after taking down a massive dinosaur? New Holiday Lights, Decorative Trees, Wall-Stockings, Snowmen and Giftable Loot Presents are all available with the release of today’s update. Santa may be a little absent, this is a prehistoric world of near-guaranteed death after all. However taking the jolly fat guys place is the Raptor Claus – ARK: Survival Evolved’s very own present giving chap as he and his sleigh skate across the night sky dropping high-end blueprints and even ARK gift codes. For a limited period, running today and continuing through until Monday January 4th, ARK: Survival Evolved is available at a hugely discounted price of $17.99, 40% off its RRP.